Darrell R. Kelley’s newly released “The Book of UWGEAM” is an inspirational guide to discovering a better life and finding love, peace, and happiness through God. 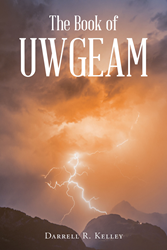 “The Book of UWGEAM”: a valuable and potent collection of musings and sage wisdom that aims to help readers discover joy in the love that God has for them. “The Book of UWGEAM” is the creation of published author, Darrell R. Kelley, a native of Boston, who works in the restaurant business and enjoys meeting people and sharing the love he has for God. Published by Christian Faith Publishing, Darrell R. Kelley’s new book is about love, unity, and the importance of respect for everyone, regardless of religious background. Darrell aims to help readers feel better about themselves and each other, but most importantly, about God. The purpose is to acknowledge God in everything, and to guide readers to a clear understanding of what God is about. This book is not a book about hatred, but a book that centers on love for God, and love for others. The objective is to encourage readers to focus on positivity; to lift up one another and practice kindness and understanding in all things. Darrell’s book challenges the church and to all believers and nonbelievers alike to focus on sharing God’s love in all they do, and reject the idea of hatred and selfishness. View a synopsis of “The Book of UWGEAM” on YouTube. Consumers can purchase “The Book of UWGEAM” at traditional brick & mortar bookstores, or online at Amazon.com, Apple iTunes store, Kobo or Barnes and Noble. For additional information or inquiries about “The Book of UWGEAM”, contact the Christian Faith Publishing media department at 866-554-0919.